~ FACS Issue No. 63: Economic Value Chains in Africa – What they can reveal for those in need. Economic Value Chains in Africa – What they can reveal for those in need. The issue deals with interlinked economic activities that contribute in bringing a product or a service from conception to final disposal after use. This set of interlinked economic activities contributes to pro-poor initiatives and facilitates better linkages between market players. The 63rd Issue aims at looking at what these interlinked economic activities or economic value chains can reveal for the life- sustaining needs of those in most pressing needs. Under the Main Developments section of this post, we have provided the abstract of the 63rd Issue and the various elements making its contents. Our Climate Action Month and Weeks continue this week, which is the last one. 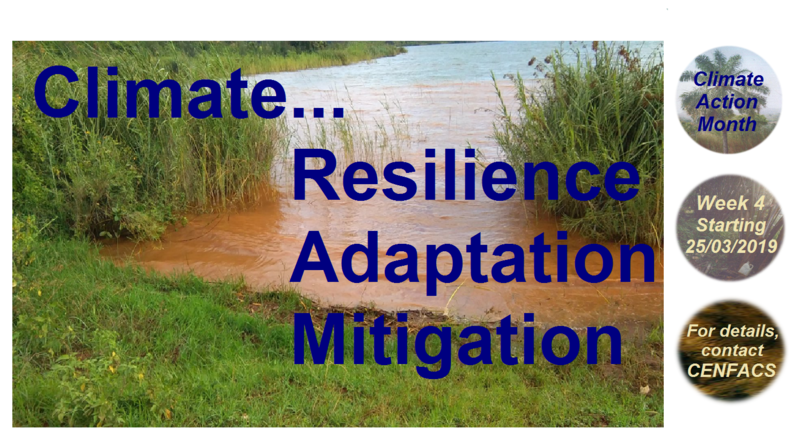 The focus for this week’s action will be on three elements: resilience, adaptation and mitigation. Mitigation will treat avoiding or minimising negative environmental impacts. Further details about actions related to each of them are given under the Main Developments section of this post. The 2019 Spring Edition of ICDP speaks about climate (i.e. the average atmospheric conditions prevailing in a region) and Life-sustenance. It looks at nine basic life-sustaining goods (that is food, environment, health, protection, education, housing, clothing, water/drink and energy) in relation to each of them with climate. Under the Main Developments section of this post, we have given the key highlights on advice, tips and hints regarding the links between climate and life sustenance. We have followed what happened and we are continuing to watch what is happening in Africa about the magnitude and scale of Cyclone Idai together with the damage it has caused so far. We are supporting other charitable organisations and non-governmental organisations as well as civil societies and all those who have engaged in helping to alleviate this environmental crisis and its victims. We hope that every effort will be deployed to scale down the impact of this cyclone and every victim will get the assistance they need and get back to their normal life. It is worth thanking all forms of help given to the Cyclone Idai Victims. In parallel to this support to the cause of the Cyclone Idai Victims, we are carrying on our work on rebuilding Africa as the Spring Relief season is featured and themed as of Rebuilding and Renewing Lives. We shall let you know of any project or activity regarding Rebuilding Africa initiative. Our search for new forms of data that show how African Children are or are not meeting Sustainable Development Goals (SDGs) is still on course. This week, we are including in our pilot research project the African Children victims of flood disaster. As a sample, we are considering cyclone victims like children victims of cyclone Idai in Southern Africa. We shall consider data related to life-sustaining needs such safe drinking water, sanitation, shelter, protection, environment, food, health etc. These data can speak about the conditions of these children and the level of meeting (or not meeting) sustainable development goals. Data can tell also if there has been a setback in meeting SDGs. Particularly, in places where schools and health centres have been destroyed, buildings have been flattened and where there is a high risk of water-borne diseases; there is a considerable amount of data to be collected and treated. To support and or enquire about the new forms of data for ACCSDGs, contact CENFACS. The 63rd Issue explore the determinants of value chains in Africa for those in most need. Value Chains (VCs) can be global, international, regional and domestic. They can include various aspects of trade such as economic, social, environmental etc. In this Issue, the focus will be on Domestic Value Chains (DVCs) and on their economic aspects. DVCs are more realistic than others, knowing the difficulties many African countries face to establish Regional Value Chains. DVCs can provide a window of opportunities not only to reduce poverty but also to enhance the quality of life. DVCs are much closer to those in most need compared to other forms of VCs. The 63rd Issue reveals and offers a different perspective what people think what CVs can do or cannot for the poor. Hence, the Issue enables to close the gap in poverty reduction knowledge and practice regarding the effects of VCs on those in most need. It further provides scope on how to understand data patterns and trends in sustainable development goals related to those in need. VCs approach is not an end of itself; it reveals the provisions and limits that those in need can expect from CVs. In this Issue, those in need include the following: poor people, families in need, children in need, Africa-based Sister Organisations in need, communities in need, small and poor traders in need. The setting up and development of VCs can be beneficial for those in need. CVs processes can as well reveal hidden and unmet needs to be met, and what is needed to improve the skill set of poor people. Economic integration of rural farmers through domestic value chains; Acquisition of new operational skills by small and poor traders; How VCs contribute towards pro-poor initiatives in Africa; Promotion of infrastructure to create DVCs; Access to financing to develop VCs in the voluntary sector; Reducing the cost of transportation to create effective VCs; Dynamics of links for the supply chain to create and strengthen VCs; What African value chains experiences can reveal for the poor; Economic value chains niches for African organisations in need; The development of industrial poverty relief services to reduce poverty within the context of economic value chains; Experiences and lessons from value chains in the voluntary and community sectors in Africa; How to accelerate pace and extend poverty relief work through value chains; How can product diversification can help to reduce poverty and hardships; How can Africa-based Sister Organisations participate in value chains schemes; Les chaînes de valeurs économiques et la reduction de la pauvreté en Afrique; la chaîne de valeurs en tant qu’association soudée pour remplir les besoins et demandes des consommateurs pauvres en Afrique; Skills Development to Integrate and Survive Economic Value Chains (SDIEVC) project or Skills for Value Chains (Skvach) project. For pre-release details about this Issue, contact CENFACS. The above actions can be taken at personal level, in community, at work etc. To support and or enquire about Climate Action Month and Weeks, particularly Climate Action Week Four; contact CENFACS. The focus of the Spring 2019 Issue of ICDP resource is on Climate and is entitled “Life-sustenance and Climate”. Climate is defined as the average atmospheric conditions prevailing in a region. 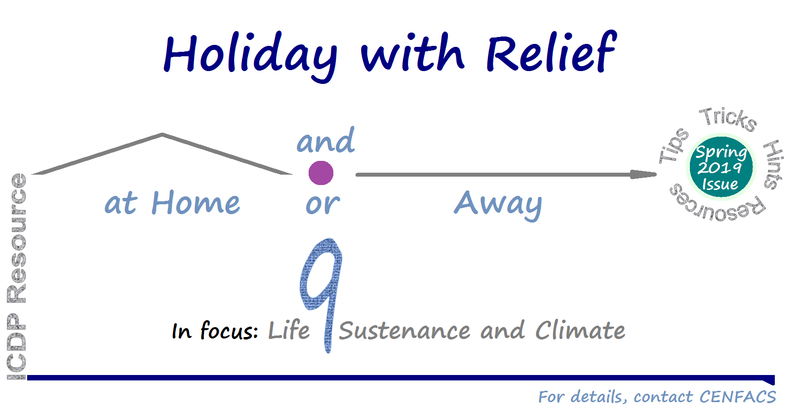 The Issue on Life-sustenance and Climate brings together nine basic life-sustaining goods (or needs) and climate in terms of our Holiday with Relief. These nine basic life-sustaining goods or needs are as follows: Protection, Food, Education, Health, Water, Environment, Clothing, Energy and Housing. It tries to establish the links between each of these goods or needs and climate while raising the relevancy of precautious and prudent handling of these links. In doing so, it provides advice, tips and hints on maintaining these relationships for an adapted, mitigated and resilient holiday. It means a holiday during which we can adapt, mitigate and be resilient with the climate. The following are the key highlights on the advice, tips and hints about the links between these nine life-sustaining goods (or needs) and climate. Its link with climate indicates how we defend ourselves from trouble, harm or loss that climate can cause to us. Planning a successful holiday means making sure that we organise a protective plan of action or setup to protect ourselves from climate variation or change. It is pointless to say that what we eat is influenced by climate change or variation. These change and variation can lead us or force us to adapt to particular food products to consume. So, knowing what climate can look like in holiday can help to plan food to cope with the climate change. We can use climate change food calculator to take our food planning to the next level. Knowledge and understanding acquired through study and training are useful for a satisfying and rewarding holiday. They are also important to know and understand climate so that our holiday finds its meaning and purpose, as well as stays within the goals we set up before its starts. Climate change can affect our general condition of body and mind; which can in return impact our holiday. Unless we want to have holiday without relief, Holiday with Relief implies the integration of both health and climate for a good well-being and healthcare. Knowledge and skills about cover provision and protection from climate change can help to better keep our time of enjoyment and relaxation as we planned it. Adverse climate change can affect our shelter or housing. Knowing about this potential climate effect or impact can help to make the necessary housing planning or shelter we need for a smooth holiday. Learning and keeping informed about how climate change is affecting the water we drink and use, and how water authorities are trying to regulate water matter can help our holiday. The last thing we need is to experience the lack of or shortage of water during our holiday because of climate change. Just as we do not want flood disaster during our holiday. Both abiotic and biotic conditions and factors can influence our holiday and make it without relief. Learning basic skills and acquiring essential knowledge about the environment in relation to climate change can be a deciding factor for our happiness or unhappiness during our holiday or break. Garments and or anything we dress to cover human bodies have been recently even dramatically affected by the climate change. As the climate getting warmer than in previous centuries ago, we may need less and less heavy clothes on our bodies. This applies to the clothes we wear during the holiday season as well. The way we use power (water, electricity, gas, charcoal, wins etc.) matters with the climate change. A better understanding of energy use and its sources can provide answers about its interaction with climate. This can be done without ignoring the possibility to make some energy transition or renovation during our holiday. To sum up these highlights and Spring 2019 Issue, it is right to argue that if one knows the state of the climate during their holiday, they can reinforce their ability to act at will. Climate knowledge and skills give us freedom as they liberate us from compulsion. In other words, they give us the independence to enjoy our holiday. One can think of climate forecasts in helping us to better plan and prepare for any climate change. For the full version of Spring 2019 ICDP, please contact CENFACS.